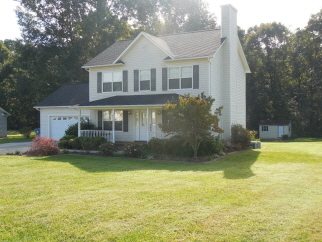 Mt View-This 3 bedroom, 2.5 bath, 2-story home sits on a .62 acre lot. The main level offers hardwood floors in the great room with a gas log fireplace, a foyer & formal dining room. The eat-in kitchen has new tile flooring, an island & black appliances. The main level laundry & half bath have new tile as well. Upstairs features the master bedroom with a walk-in closet & dual vanities in the bat & two additional bedrooms. The front has a large porch with swing. The rear has a deck & back paver patio. The storage building remains with the home. County taxes & city water.